Lance Thomas aka @slangmagic: The most driven person you will ever meet. Pro ball player. Music junkie. Doberman Pinscher lover. From watching Lance bang down on the blocks for four years in Cameron, none of us can question his drive, and who are we to say he doesn’t love music and who doesn’t love hanging with a Doberman? But today Lance Thomas made the last piece of that 140-character Twitter puzzle a reality—he is a pro ball player, and not just any pro ball player. He is on an NBA roster. On the eve of this year’s strike-shortened NBA season, Lance Thomas received the greatest Christmas gift he ever could have asked for when he found out he had made the New Orleans Hornets. His journey to the NBA has been unconventional to say the least, but it perfectly personifies all that made Thomas a great member of the Duke Blue Devils: his grit, his determination, and his intensity. Let’s take a look at how he got here. Thomas starred at St. Benedict’s Prep in Newark, New Jersey throughout high school, leading his team to a state championship his senior season while earning McDonald’s All-American honors. He averaged 14.5 points and 6.5 rebounds that year en route to winning his second state title in his time at St. Benedict’s. Thomas committed to Duke in the spring of his senior season, waiting much longer than most other top recruits to sign with a team. He chose to attend Duke instead of staying local and playing college basketball at Rutgers. Lance made an impact at Duke from the time he first stepped on the floor. Although it normally takes big men more time to adjust to the pace of the college game, Thomas impressed Coach K immensely during preseason workouts before his freshman year. 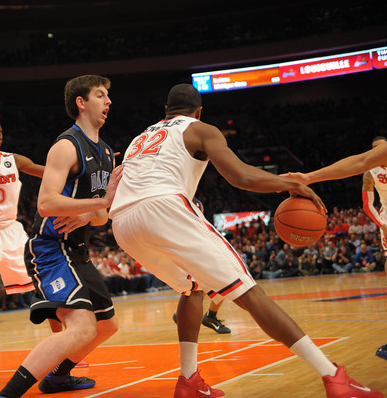 His hard work paid off as Thomas was named a starter for the second game he ever played wearing a Duke uniform. 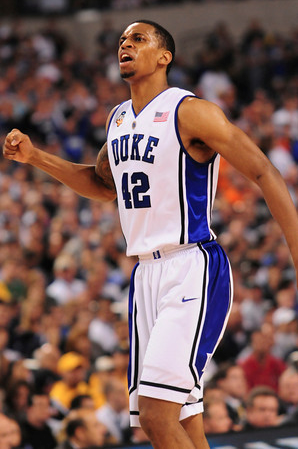 He would go on to start games in all four seasons of his Duke career, including 39 of the 40 games in Duke’s 2009-2010 national title run during his senior season. 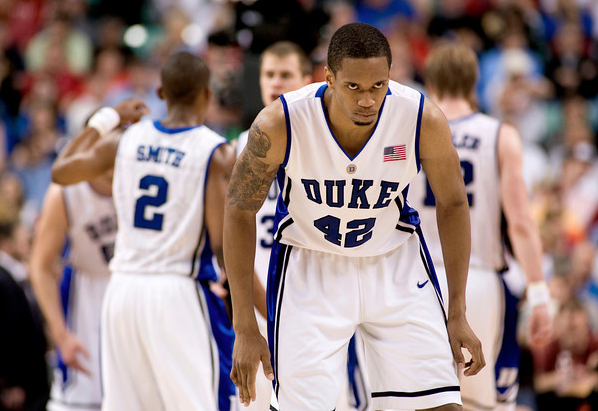 He was not a low post force during his time at Duke, that is no secret. In fact he never averaged more than 5.3 points per game during his time there, but Lance Thomas was the master of intangibles. While his teammates were scoring points, he was making sure he did the little things—grab rebounds, body up an opponent’s best big man, block shots, hustle, dive on the floor after loose balls and take charges. Those are the plays that would inevitably define Thomas’s career at Duke; that is the reason why when he calls himself “the most driven person you will ever meet,” we know he isn’t lying. Thomas strove to be an NBA basketball player. Playing for Duke is a great first step to take toward reaching that goal, but despite the quickly rising draft prospects of Thomas along with fellow seniors Jon Scheyer and Brian Zoubek during their 2010 championship run, none of them were drafted that season. When the NBA doesn’t come calling for some Blue Devils, they’re almost certain to receive offers to play in some of the top leagues in Europe. Lance could have jumped the pond like many of his teammates (Kyle Singler and Martynas Pocius in Spain, Jon Scheyer in Israel, DeMarcus Nelson and Daniel Ewing in Ukraine, or David McClure in Lithuania). But Lance Thomas didn’t want to play in Europe, he wanted to play in the NBA. So instead of taking a much larger contract to play for a European team, he gave the league a shot and tried to make a roster as an undrafted free agent. He played that summer in the Orlando league with the Nets, but did not make the preseason roster. Instead of taking his talents overseas to Europe, Thomas kept his dream alive when he was drafted by in the 2nd round the Austin Toros of the NBA Development League (aka the D-League). Continuing to improve his offensive game in his only full season with the Toros, Lance Thomas averaged 12.6 points and 5.5 rebounds in 46 games. This season did not pass without any additional adversity, however, as Thomas suffered a seizure on the court during a game against the Idaho Stampede on March 26, 2011, ending his season four games early. Luckily for Lance, he was able to make a full recovery and continue to improve his game. Lance’s stellar play in the D-League earned him a spot on the United States’ team for the 2011 Pan-American Games in Guadalajara, Mexico. Thomas was a key contributor to the US team that eventually earned a bronze medal at the Pan-Am Games, averaging 8.2 points and leading the team with 7.6 rebounds over the tournament’s five games. Thomas also shot 90% from the free-throw line and was the team’s leading scorer in its 94-92 victory over the Dominican Republic in the bronze-medal game. Thomas returned to the Toros directly following his great performance on the international stage with renewed confidence and the same passion and intensity. This translated well for both Thomas and the Toros, who posted a 3-1 record in its first four games of the 2011 season. Thomas continued to step up his game, posting 17.3 points and 10.5 rebounds over those four contests, including an impressive 24 and 16 in a victory over Tulsa. As the D-League season began the NBA lockout was finally drawing to a close. Training camps were set to open the day after the Toros’ fourth game of the year. This is when Lance received his second shot at the NBA, as his call finally came and he got invited to training camp with the New Orleans Hornets. Although he had received the call to training camp, Lance’s greatest hurdle was yet to come. His first preseason game was very promising, however. With much of the Hornet’s roster on a plane from Los Angeles following the Chris Paul trade, Thomas started for the Hornets in their first preseason game. He tallied eight points and seven rebounds in 37 quality minutes. This was the first sign that unlike his last stint with the Nets, Thomas might actually be here to stay. The Hornets’ second preseason game had me a bit more scared. As New Orleans tinkered around with its new pieces, Lance only played eight minutes and did not score. But when the final cuts were made on Saturday afternoon, Thomas was the one with the last laugh. What will the Hornets gain from Lance Thomas? Let’s keep it realistic, he’s not going to start or even log significant minutes on this team this year. However, when he gets his chance, he is the type of player that always seizes an opportunity. Lance’s career in the NBA hinges on the same things that made his college career so special: the little things. He’s going to have to continue to be that guy that plays defense, rebounds, and fights for loose balls, but at least he won’t be struggling to adjust to a new role on an NBA team, that’s what he’s been doing since he started college. 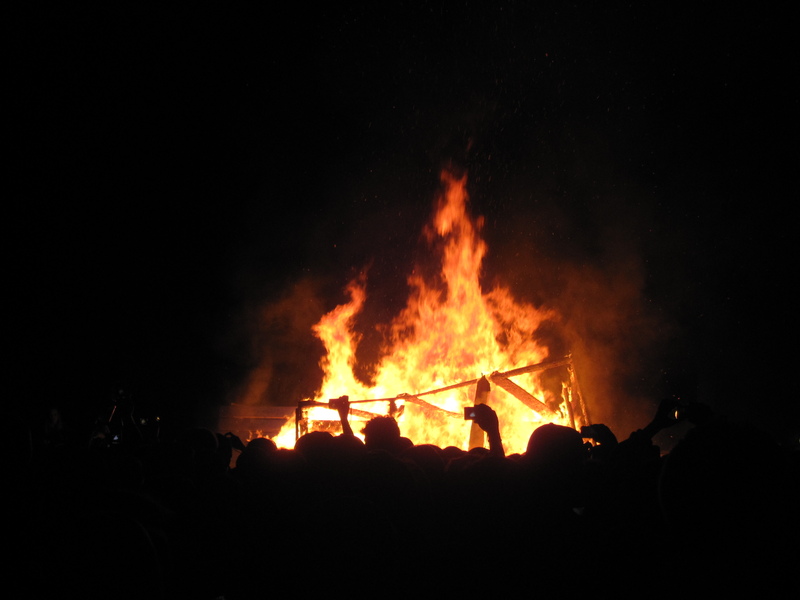 Lance’s story doesn’t end here, in fact some might say that it is only just beginning. However, making an NBA roster does not guarantee that you are going to stick around. Thomas’s next task is going to be to fight for minutes and to keep a spot on the active roster. Hopefully Thomas’ hard work continues to pay off and he can make a career of it. In the end, it’s only fitting that the NBA’s season starts on Christmas day this year, because I can’t think of anyone who wouldn’t want to wake up on Christmas morning knowing they’ve realized a lifelong dream. Best of luck to Lance and all of Duke’s NBA players this season from all of us here at Crazie-Talk, and happy holidays to all of our readers! Stay Crazie, my friends. Duke Hoop caught up with Josh Hairston, Quincy Miller, and Austin Rivers following their 131-63 victory over the US Virgin Islands Saturday night to talk Duke, team chemistry, and their futures. Andy Katz gets a head start on who to watch for in the 2011 draft. 4 Blue Devils made the list: Kyrie, Mason, Kyle, and Nolan. While we love the praise being given to Kyrie and Mason, we’re certainly hoping they stay at Duke a little longer than Katz thinks. I suppose Roy may actually have a point. While 32 point beatdowns are enjoyable, good competition might be nice every once in a while. Interesting read on JJ Redick as he looks back on his transition from college to the NBA, reflecting on where he is now and giving some advice to the new draftees. Though both went undrafted, Jon Scheyer and Brian Zoubek have been named to summer league rosters and will get their chances to make it to the NBA. Best of luck to both of them, as well as to Elliot Williams, drafted 22nd by the Portland Trailblazers! 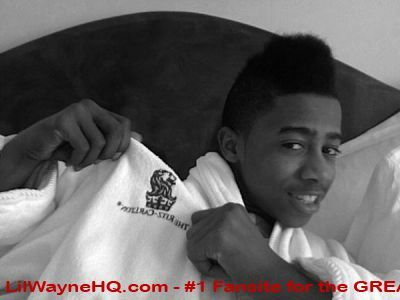 Finally, just wanted to give a special thanks to all our readers on Crazie Talk’s 1 year anniversary! We can’t believe how many followers we’ve gained over the past 12 months. As always, we encourage you to send us feedback at email@crazie-talk.com! Last week you heard from top Duke target Austin Rivers. This week, our very own Kyrie Irving writes about his perspective coming into the season, his take on the championship, and the possibility of back to back titles. Grant Hill’s play has been one of the main reasons the Suns have reached the Western Conference Finals. Although he’s been assigned the daunting task of guarding Kobe Bryant, Grant has had one hell of a season and continues to represent our university with pride. For him? For us? Probably both. You can check out Seth’s interview with 620 The Buzz here. You can also hear 620 The Buzz speak with future Devils Josh Hairston and Kyrie Irving. The future is absurdly bright. So two weeks ago, we mentioned that GP3 was trying out for the Super Bowl Champions. While it doesn’t seem like that will result in a job, there are now rumors he is looking into an assistant coaching position at Mount St. Mary’s. Greg was always a team leader during his time here at Duke, and we’re sure he would make a great coach. Coach Collins talks Nate, Coach K, and the 2010-2011 season in this great interview with Clint Jackson. We at Crazie-Talk would also like to give a special congrats to his father, Doug, who was recently named the new head coach of the Philadelphia 76ers. Best of luck in Philly! …thinkin’ of bliss of the good days. Tupac lyrics aside, these two interviews are two of the best I’ve ever read – from two of the most hard-working players I’ve ever had the privilege of watching. They gave everything they had on the court, and their perseverance was rewarded with the ultimate prize. Congrats to Jon, Lance, and Brian for an amazing four years at Duke. They’ve made us all proud to be Blue Devils! 4 Comments Posted on March 8, 2010 by Amogh Analysis, Featured, Heel Week! Shortly following Duke’s 82-50 decimation of North Carolina on Saturday, injured Tar Heel big man Ed Davis tweeted a single word: “Unreal.” Unfortunately for Ed, Roy Williams and the silenced legions of sissy blue, the game was very real. And it was beautiful. 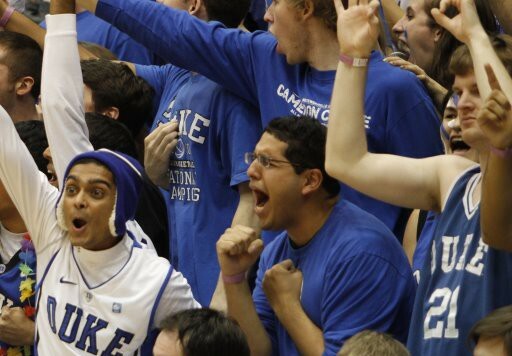 Dan Shulman noted in the ESPN broadcast that the game was a 2 hour party for the Cameron Crazies. We had a lot to celebrate: senior night for Jon, Brian and Lance, a share of the ACC Championship, recruits watching in the stands, and so much more. There’s a lot to talk about, so let’s get started. I think a lot of people teared up as Jon Scheyer was introduced before the game. For four years, Jon has been a consummate leader at Duke. An uncommonly intelligent player, Jon always has his game under control and is able to make the right decision. The fact that he was recruited as a shooting guard and is now a finalist for the Cousy Award, which honors the nation’s best point guard, speaks for itself. Jon is an extension of the coaching staff, a true team captain, and should be an All-American this season. I love the guy and wish Duke could keep him forever. On Saturday night, Jon made his statement for ACC Player of the Year, finishing with 20 points and 7 assists (all of the helpers came in the first half). When he came out in the final minutes, his parents were emotional, particularly his mother. They are fan favorites and come to nearly every game. After three years of home losses to UNC, I’m glad the team gave Jim and Laury something to cheer for. Lance and Brian played fewer minutes than Jon—with 16 and 20 respectively—but each made his presence felt. Zoubek is making me so sad; his play in the second half of the season has been such an improvement over the rest of his career. He had 8 points and 13 boards, and even had a little Dream Shake and jump hook on the baseline. Lance contributed two points and six rebounds before fouling out with about six minutes left to a rousing “LT! LT!” chant from the student section. His tough D, which earned him a spot on the All-ACC defensive squad, was once again stellar (although, what UNC player did he really have to shut down?) Lance may have the regal tattoo, but both he and Zoubs were Kings of New Jersey Saturday night. In our ACC preview of the Tar Heels, we figured that it would be a race between UNC and Duke for the regular season title. Well, we were right about Duke at least. The victory put us at 13-3 and tied with Maryland for another regular season championship, our 12th. Although it’s tough to share anything—especially with the insane Turtle nation—it’s always good to hang a deserved banner. Once again, the three (All-ACC) S’s led Duke to victory; Nolan, Kyle and Jon scored 65 combined points. So essentially, K could have thrown them out there with two mannequins and they would’ve beat the defenseless Holes by 15. (Also, Duke could have gone scoreless in the second half and still won 53-50.) Nolan crossed so many people that I lost count. In the first half, he left Larry Drew cemented to the floor and drove for a thunderous dunk. Kyle had 19 in the first half alone and was beating UNC by himself for several minutes. The Big Three came to play, and UNC was left cowering on the bench. Having three legitimate 20 point scorers is a luxury that could translate to more postseason success. And as Coach K has repeatedly stated, even at the expense of a certain Chronicle sportswriter, our stars are not tiring out—and their continued dominance proves it. Earth, Wind and Scheyer (copyright!) will lead us deep into March. With UNC’s season becoming more disastrous every game—even more so than Haiti, per Roy—attentive basketball fans have started to doubt Williams’ ability as a strategist. The guy can definitely recruit and is a great salesman of the powder blue program. And he has one great system predicated upon speedy point guards and forwards who can get up and down the floor. But this year, UNC has neither of these things. And Roy simply hasn’t adjusted. Nor he has been particularly supportive of his players in this difficult season, a point this blog has made several times. Coach K, on the other hand, is still one of the game’s best in-game coaches and motivators. Early in the first half against UNC, he ripped into the Plumlee brothers for a poor defensive effort. After replacing them with Z and Lance, Coach K turned and told Miles and Mason—’that’s how you get a rebound!’ When Miles returned to the floor, he made a fantastic defensive play, stealing the ball and advancing it to Scheyer in transition. K rewarded him with more playing time. Miles came through again late in the game, when he flushed Duke’s final two points off a perfect alley-oop pass from Nolan. He nearly tore the rim off on that one—see the pictures for evidence. The thing to take away from this exchange—no matter how ordinary it seems—is the way K uses anger and frustration to motivate his players. Instead of throwing them under the bus as Roy does, Coach K rewards his players for improvement and celebrates it with them when they perform better. Miles had a lot to say on this point after the game: see the video from WRAL here. Several recruits and committed players witnessed our embarrassment of UNC. In addition to 2010 commits Kyrie Irving and Josh Hairston, several players visited to get a better look at Duke’s program. ’10 forward Michael Haynes, ’11 wing Michael Gbinjie and ’12 shooting guard Shabazz Muhammad took in the action from behind Duke’s bench. The latter two are both top 10 players in their classes, and Michael Haynes may be another option for next year along with JuCo recruit Carrick Felix. It’s too early to offer any judgments on our chances with Gbinjie or Muhammad, but Duke’s dominance surely made an impression. Kyrie Irving, along with his St. Patrick’s classmate and Twitter stalwart blank908, had a great time in the first row. Irving and Hairston jumped up several times during exciting plays and cheered like mad. You can tell that these guys are itching to get to Duke next year and join this team. Kyrie had this to say after the game: “Hard to say goodbye…but I’ll be back in the summer…” We can’t wait to see what Irving, Hairston and Thornton bring to next year’s team, which has an opportunity to be one of Duke’s best in several years. John Henson was easily the best player on the floor for Carolina on Saturday night, finishing with 14 points on 5-10 shooting, including some improbable buckets in the post. However, Henson was the Crazies’ primary object of scorn, drawing catcalls like “Eat A Hamburger” and “Gumby! Gumby!” Nor did John improve his lot with his attitude; after dunking in the general vicinity of Miles Plumlee, Henson got a little too pumped up and talked trash while running back up the court. Perhaps he didn’t realize his team was still down by 30 points. Roy quickly pulled him out of the game and Henson was left looking like a sad version of Lil’ Twist from Young Money. (thanks to “bmorecity_bear” for the spot-on comparison). But the weekend got worse for Henson, in a way. His sister Amber, a top-5 recruit in the class of 2011, committed to Joanne P. McCallie and the Duke Women’s basketball program on Sunday. Amber had considered joining her brother in Chapel Hill, but Duke’s medical program was too attractive. (Yes! Academic superiority is paying off!) Henson conceded his ‘defeat’ in having Amber choose Duke on his already legendary Twitter. I don’t mind him coming to “dook” to watch his sister, but I hope Cameron is always hostile to him when he suits up. John Henson promises to be one of North Carolina’s better players for the years that he stays in Chapel Hill. Hopefully his sister is just as talented and can lead Duke Women’s basketball to its elusive first national championship to go with the conference tourney title they won on Sunday. What a great few days for Duke fans, and what an awful stretch for Gumby. With all the joy following this weekend, it might seem alluring to curl up and watch the game replay over and over again on ESPN360. But as the seniors vehemently said in post-game speeches, this season is far from over. Duke has the tools to accomplish a lot more this year—an ACC tournament title, a number one seed, and a run at the Final Four. And for once, I am more optimistic in March than in January. I can’t wait to see how high this team can fly. Check C-T later this week for our review of the ACC Tournament! Go Duke, and may UNC always lose by 30+. Here’s a little video from the end of the game. Enjoy.